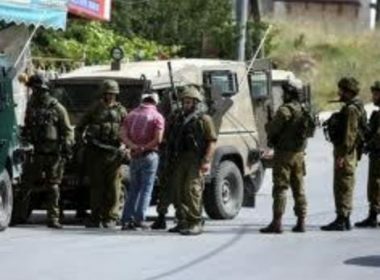 The Palestinian Prisoners’ Society (PPS) has reported that Israeli soldiers invaded, on Saturday at night, Ein al-Sultan refugee camp, in Jericho, northeast of the Dead Sea in the occupied West Bank, and abducted three young men. The PPS said dozens of soldiers invaded the refugee camp from several directions, and abducted the three young men, identified as Karam Nasser Ayed, Mo’in ‘Eleika and ‘Ameed Aktafi. The soldiers were still in the refugee camp at the time of this report, while the three Palestinians placed in an army jeep before being moved to an unknown destination.